The Osprey Atmos and Aether hiking backpacks are made by one of the top manufacturers of hiking packs and outdoor gear. Osprey knows how to make a quality bag, and these two options are both great choices for your outdoor activities. The removable top is one of the features that helps the Aether stand out from the Atmos. After removing the top, you can use it as a daypack. However, before making your choice, you should take a closer look at both options. The Osprey Atmos and Aether are made by the same company and include many of the same features. They both have a flapjack top cover, which is useful when removing the lid so that you can keep the interior of your pack dry. They also feature separate bottom compartments. However, you also have the option of removing the divider to create a larger main compartment. Both backpacks also include a front stash pocket. This location provides a convenient spot for storing items that you need quick access to, such as an extra jacket or some dry food. You also get dual-access side pockets on both backpacks to quickly reach the inner compartment without opening the top. While these features are all useful when you are outdoors, it is the differences that will help you select the best backpack for your next outdoor trip. The Osprey Atmos offers three important advantages over the Osprey Aether. The first benefit is the storage capacity. 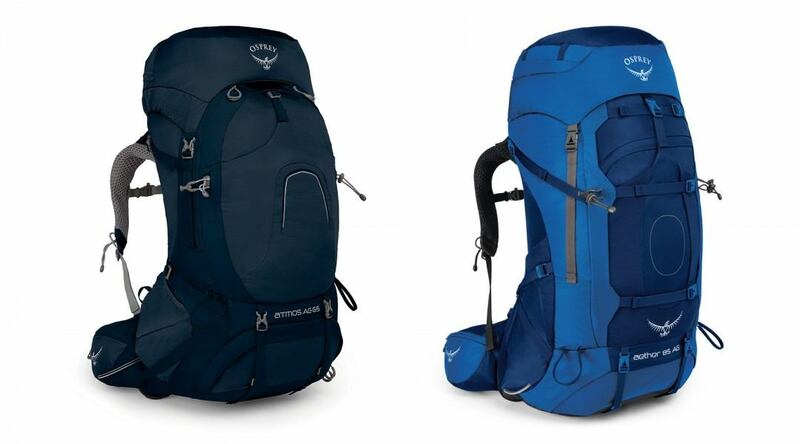 The Osprey Atmos offers 65-liters of storage, while the Aether offers 60-liters. While this is not a major difference, the extra 5-liters is enough space to store a change of clothes and other gear. Along with more storage space, the Atmos provides more storage options. You get more pockets, along with more locations to store stuff and keep everything organized. These features are great if you have a lot of small items that you need to keep separated. The third benefit of the Osprey Atmos over the Aether is the harness system. The Atmos has an adjustable hip belt, providing a custom fit around your midsection. It also includes a mesh material along the back, which helps reduce sweat and improve comfort. The Osprey Aether may be a little smaller than the Atmos, but you should not rule it out. While both backpacks feature a removable top, the removable top on the Aether can double as a daypack. This feature is not included with the Atmos. The harness system is also different. The Aether includes the older harness system found on most Osprey hiking backpacks. Instead of an adjustable hip extender, the Aether allows you to adjust the length of the torso. However, with both options, you can adjust the shoulders and the sternum strap. Which Hiking Pack Should You Buy? The Osprey Atmos and Aether are two of the highest-rated hiking backpacks, making it difficult for hikers to choose the right pack. Overall, the Atmos has the most benefits. It provides slightly more storage space, along with material that offers more durability and extra pockets. If you need to keep your gear organized, the Atmos provides the most options. The Aether is also a quality backpack with a removable top that doubles as a daypack. However, if you do not need this feature, the Osprey Atmos remains the top option.